The sheer pandemonium in Turkey continues. It's not just Turkey's currency and sovereign bonds that have resumed their plunge today: Turkish stocks are all sharply lower, with the Borsa Istanbul down over 4% after dropping even more earlier in the session. 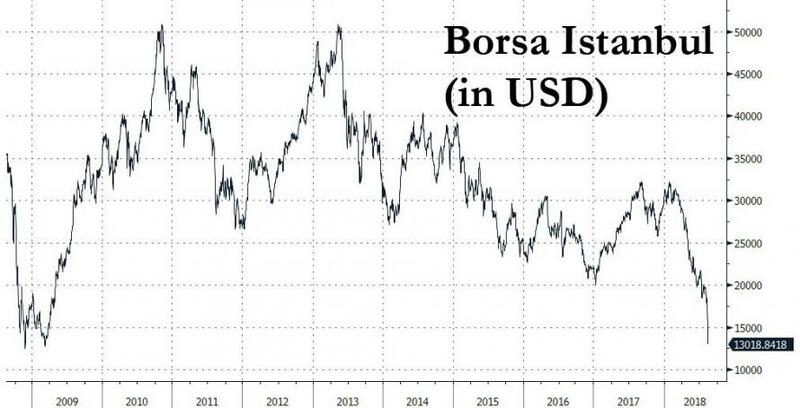 However, that's in local currency terms: in dollar terms, Turkish stocks are now at their lowest level since March 2009. 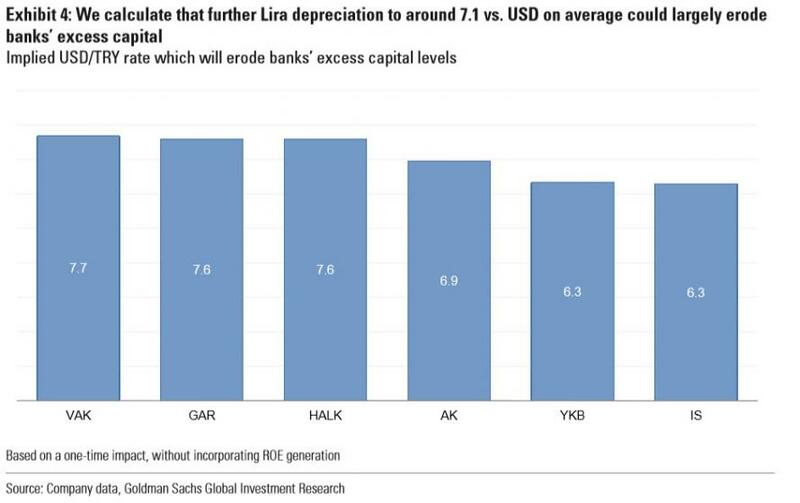 So far in 2018, the local stock market has lost a fifth of its value in lira terms, but a whopping 55% in USD terms, while banks - which Goldman recently warned would see their excess capital wiped out if the lira hits 7.1 - have fared especially bad with the BIST 100 bank sector down 7.4% on Monday, 40.7% in local currency terms for the year to date, and down a whopping 70% YTD. “Within the current backdrop, we view banks as being vulnerable to Turkish Lira depreciation given that it impacts,” Goldman warned last week. 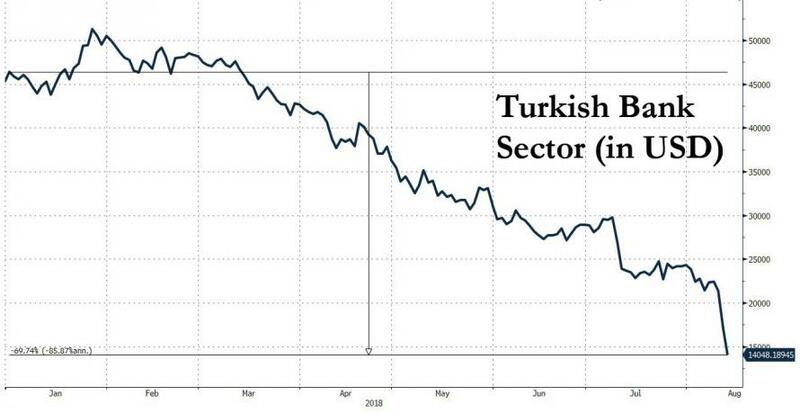 However, another even more troubling move has been seen in Turkey’s credit default swaps which are "shooting through the roof" because the economy is heavily indebted and there is "widespread fear that a good part of these claims will have to be cancelled," wrote Commerzbank analyst Ulrich Leuchtmann. 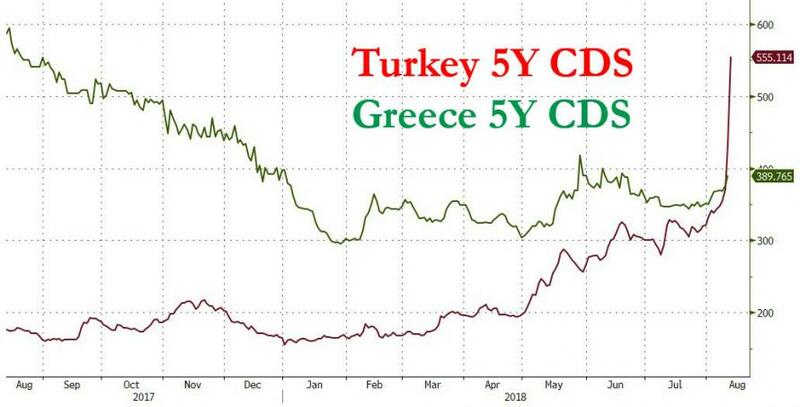 As shown in the chart below, five-year Turkish CDS soared over 125bps to more than 550 today, the highest since 2008, and surpassing the similar maturity CDS for Greece. Leuchtmann continued his dire outlook on Turkey, and warned that USDTRY would "strive towards infinity" on the currency market, noting that "exchange rates can then no longer be reasonably projected." "if confidence disappears as radically as in Turkey at present, money loses its value totally. This effect is domestically called hyperinflation." 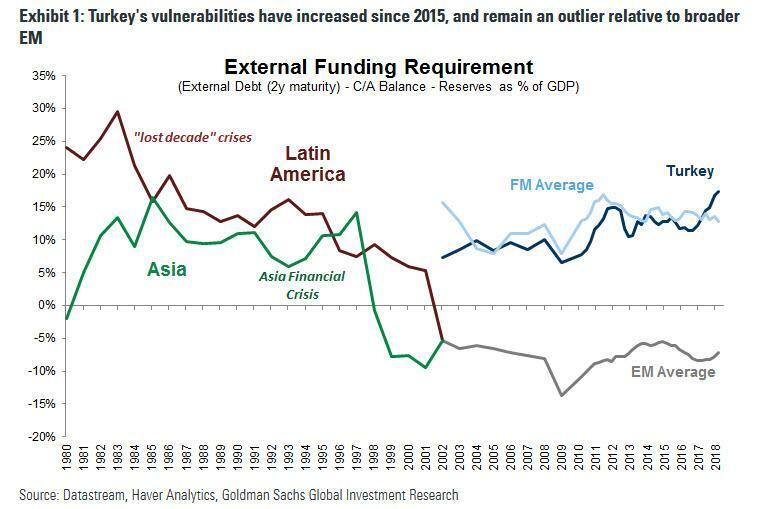 Meanwhile, since a state receives most of its revenue in its domestic currency, it must either adjust its tax rates as quickly as hyperinflation gallops – which is hardly practicable or the government cannot service its FX-denominated debt any more. ... capital controls would also be a death sentence, if only a somewhat delayed one, as the economy would implode and it would become impossible to roll over or refi any USD-denominated debt, resulting in a wave of corporate defaults, once again sending the lira into the Venezuelan stratosphere.